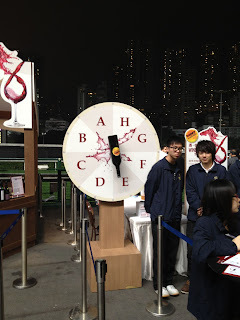 Last night I went down to the weekly races to participate in Wines in the Valley. The way it works is that you can either buy a wine pass for $160 which gets you 6 wine tastings (50 mL), or you can buy wines by the glass. 50 mL, palease! I'll take a glass. There are four stations; USA, Italy, Australia, and France. Last night's theme was France, but I'm not really sure what that meant as all the countries were represented. Anyone have any insight into that!? A surprise for me during the evening was how much I enjoyed Tiger draft. Maybe it's because I don't drink beer often, or maybe it's because I haven't had Tiger in a while, but man, stuff was smooth, frothy and delicious. What's your favorite game race day brew?